One of the caveats with Windows Phone development is that it has to be done from Windows, just like iOS development has to be done from OS X (normally, although some cross platform technologies enable development via other OS/platforms). Of course, I did not want to give up OS X, so here’s how I have my environment setup… I have a virtual machine running Windows 7, in which I can run the Visual Studio development tools. I am able to deploy to a physical Windows Phone device using the USB connection. However, with this configuration you will NOT be able to use the Window Phone emulator, which is a part of the Windows Phone development SDK. The Windows Phone emulator is not supported inside of a VMWare virtual machine because the emulated operating system environment does not meet the minimum requirements (specifically the graphics drivers are not WDDM 1.1 compliant). If you try to use the phone emulator inside the virtual machine, you will just get a blank screen. I spent a few hours trying to find a workaround, to no avail. You can use the Windows Phone emulator if you boot your Mac into Windows using Bootcamp, but I wanted to keep OS X as my primary operating system. Note: All of the project setup work will be done through the Windows virtual machine instance. There is a detailed “Getting Started” guide for PhoneGap and Windows Phone available at http://phonegap.com/start#wp. This will provide you with all the information that you need to get started with PhoneGap applications for Windows Phone. As a part of the setup process, you will need to download and install the Windows Phone SDK from http://www.microsoft.com/download/en/details.aspx?displaylang=en&id=27570. This will include a copy of Visual Studio Express 2010 for Windows Phone, as well as additional tools for Windows Phone development. To be able to deploy an application to a physical Windows Phone device, you will need to register as a Windows Phone developer on MSDN App Hub at http://create.msdn.com/en-US/home/membership. This is a very similar model to Apple’s iOS developer program. There is a $99 annual fee, and once you are registered, you will be able to debug on devices and distribute applications via the Windows Phone Marketplace. However, debug provisioning is much easier. Instead of signing each application with a debug certificate, you just have to register your device as a development device. Once the device is registered, you will be able to deploy to it without any other special steps; this is very similar to the provisioning model for Nook devices. When linking my AppHub account to my Windows Live account (a required step), I ran into a vague error message “There’s a temporary problem with the service. Please try again. If you continue to get this error message, try again later.” After scouring the web for this error message, I found a few threads that mentioned this error is likely the result of an incomplete profile for your Windows Live account. Sure enough, I went into live.com and filled out my profile (including contact information), and this error went away. Below are the specifics for my setup; I did not have any issues connecting a Windows Phone device with this configuration. To deploy an application to a Windows Phone device, you just have to use the Windows Phone Developer Registration Tool, and walk through a few simple steps to associate your phone with your developer account. This tool is installed when you install the Windows Phone SDK. 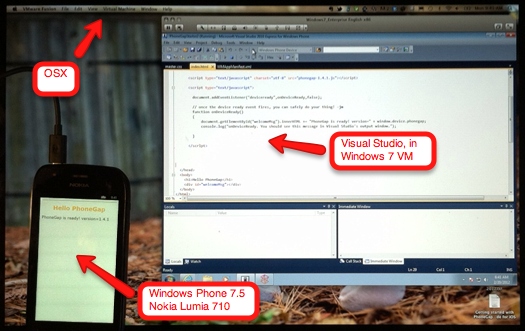 You can read full details about debugging Windows Phone applications on MSDN. As I mentioned above, I have heard that others have encountered problems when trying to deploy applications to Windows Phone devices via a virtual machine on OSX, but I have not had any problems with this configuration.